Geography/Culture: Africa: Nigeria, Yoruba. 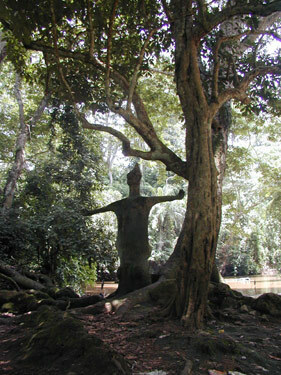 Her principle shrine is in the city of Oshobo, past which the river Oshun flows. Description: Tall, light-skinned, beautiful breasted Goddess of beauty, love, conception and divination; She Who taught the art of divination to the deities; Owner of brass; Eponym of the river Oshun; She Who is renowned for Her beauty, desirability, and the meticulous care She takes of Her appearance; She Who wears brass bracelets from elbow to wrist; Divine Harlot; "Civilised Woman"; Mother of many; She Who `fights' with dysentry, stomach ache and menopause. To Whom Sacred: cowrie shells; river worn stones; small brass rods; the number 16 (the number of cowries used in divination); brass bracelets (worn by Her worshippers as their insignia); brass fan (used in Her dances); brass sword (used in Her dances); thin soup of wild lettuce; yam porridge; bean porridge, and other bean foods; honey; maize beer. Taboos: guinea corn; guinea corn beer; snails. Her shrine, attended by a virgin, is decorated with cast brass figures. It includes pots of water from which Her worshippers may drink, and the sixteen cowries used in divination. Her priests there wear a false top-knot made of grass, cloth and indigo dye, like the one She made for Herself after Her hair was stolen. And see also the Goddess Anthology under Oshun. Male Associates: consorts Ogun, ---, god of iron, Shango, ---, Shopona, ---, god of smallpox. Lovers Osanyinu, ---, god of medicine, Ifa, ---, god of divination, and Orishala. Haitiian Erzulie, qv, has some similar qualities. She taught Oya, qv, the art of divination, and they share the same consort. Her long straight hair was stolen from Her by Yemoja, qv Iamanja. worked on: July 1990; August 1991; June 1995.